Since 2015, LWB has been working in Senegal through the Young Leaders component of its BSF Campus program and through the deployment of an Ideas Box. More than half of 12.5 million Senegalese inhabitants live below the poverty line, and the country is ranked 166th in the world in the Human Development Index of UNDP in 2009. Moreover, 35% of the children less than 15 years of age are forced to work, with girls being the most affected as 13.8% work 28 hours per week, compared to 1.8% of the boys. Although the government has been attempting to establish more schools, many do not have sufficient budgets to be entirely operational. An integral component of the BSF Campus program, the Young Leaders aims to develop a generation of librarians and cultural entrepreneurs who are thoroughly trained towards innovation and social transformation. On another level, the Ideas Box in Ziguinchor for street children is incorporated in the child protection and education missions managed by BSF, making it an excellent tool for supporting and amplifying the impact of the works of our local partners. The extreme poverty of entire minority populations, tied to the chronic instability of the area, has lead to a rural out-migration to the main city of the region: Ziguinchor. The newly arrived populations settle in already overcrowded neighborhoods that have little access to basic educational and social services. On April 20, 2016, the first Ideas Box in Senegal launched in Dakar. Following its inauguration, it was brought to Ziguinchor to be deployed for street children and child workers in partnership with the Franco-Senegalese non-profit, Futur au Présent. From May to October, a total of 271 activities that were offered: reading, theater, singing, and writing workshops, as well as academic support, educational exercises, film and documentary projections amongst others. In total, the Ideas Box totaled 5549 users. Children lacking access to school in Ziguinchor (South Senegal). Young Leaders is a project incubation program over 16 months that aims to develop a new generation of cultural entrepreneurs able to carry out projects with a strong social impact. 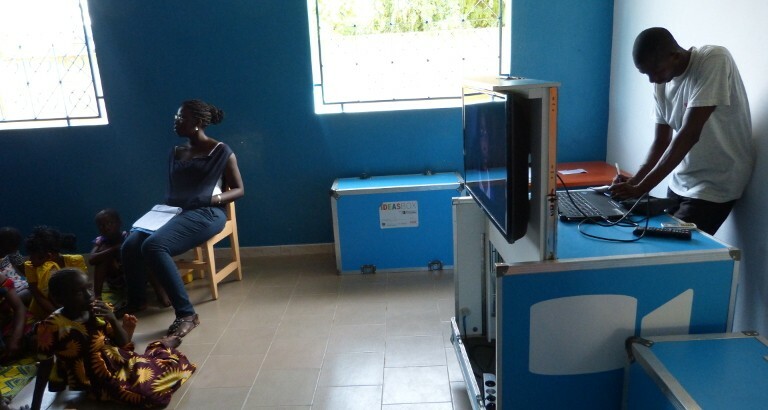 Between workshops, the 10 youths of the program were accompanied in the creation and improvement of their professional projects: to establish an information center in the city of Mbour, to create a municipal library in the city of Pikine, to develop an online system of information for the Medical Imaging Service of the Aristide Le Dantec de Dakar hospital, establish a documentary portal for the students of the African Centre for Higher Studies in Management, to name a few of the initiatives. The presentation of the certificates of achievement took place in November 29, 2016, in Dakar. One of the Young Leaders, winner of a competition of concept notes, will receive 2000 € to develop his mobile library project. 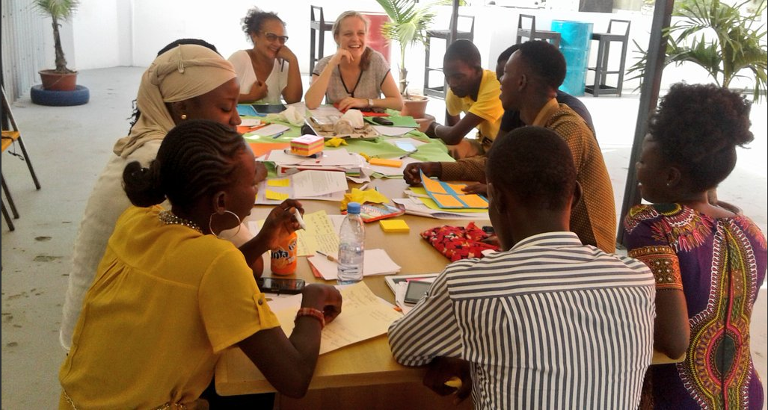 10 French-speaking, Senegalese librarians and cultural entrepreneurs. Marc Roger left in May 31, 2009 by foot along a meridian running from the French town of Saint-Malo to Bamako, the capital of Mali, reaching his destination in June 2010. Throughout his voyage between the two towns, he read books, poems and stories by French, African and Francophone authors in schools, libraries, bookstores and, in particular, schools associated with the UNESCO network. This one year voyage allowed the public reader to criss-cross France, Spain, Morocco, Mauritania, Senegal and Mali. Altogether, he travelled more than 7109 km with Babel, his donkey and travel companion, holding nearly 130 readings and reaching more than 7850 listeners. To encourage the emergence of local book supply chains; more than a third of the books were purchased from African publishers. To directly promote the literature of North and West Africa among the library’s public. To support the practice of reading and develop a taste for reading among children and adults in these countries. To promote access to culture and education. Libraries Without Borders assisted Marc Roger’s interventions by offering 20 trunks to the libraries and schools he visited in Senegal and Mali. Each contained 91 francophone books intended for a mixed public (ages 2-4 to adult). The trunks left the warehouse in March 2010 and arrived in Senegal in May and in Mali in June. They constitute small mobile libraries intended to be sent back and forth between the various schools and libraries of the villages and towns concerned. The targeted donation of more than 1800 francophone books to the schools and libraries visited by Marc Roger in Senegal and Mali. The acquisition of more than a third of the books from African publishers, specialist bookstores and the International Alliance of Independent Publishers. Funding the transport of 20 trunks to Senegal and Mali.